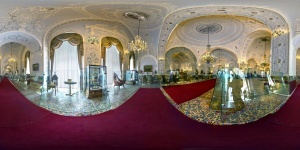 Virtual Tours and Panoramic images. Info to be come soon. 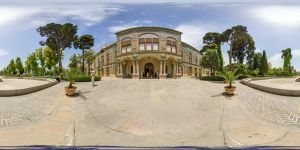 Shamsol Emareh Palace seen from Nasser Khosrow street. 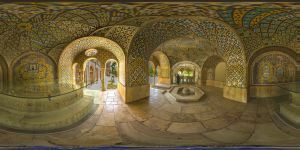 Shams-ol-Emareh (Edifice of the Sun) is the most stunning structures of the Golestan Palace. The idea of building a tall structure came to Nasser-ol-Din Shah from pictorial images of European buildings. The Monarch wanted a structure from which he could have panoramic views of the city. 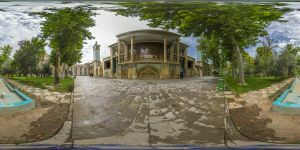 Construction on the Shams-ol-Emareh began in 1865 and was completed two years later. The building has two identical towers. The exterior views have multiple arches, intricate tile work and ornate windows. This building is a fusion of Persian and European architecture. 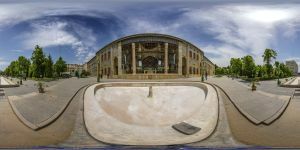 Talar Salam (Reception Hall) was originally designed to be a museum. 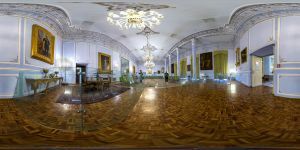 After the Takht-e-Tavoos (Iranian's famous Jeweled Peacock Throne) was moved to the Royal jewels collection at the Central Bank, this hall was designated to hold special receptions in the presence of the king, hence the name Talar Salam. This hall has exquisite mirrors work. The ceiling and walls are decorated with plaster molding. The floors are covered with mosaic. 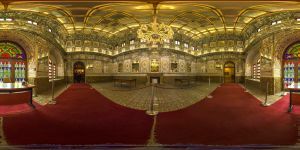 During the reign of Nasser-ol-Din Shah, this hall was used to exhibit Iranian and European paintings alongside gifts presented to the Iranian court. Royal jewels were also exhibited inside glass cases. These jewels are now housed at the Royal Jewels Museum of the Central Bank. 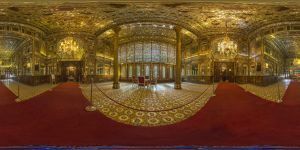 The Marble Throne (Takht-e marmar) in Golestan Palace is a 250 year old royal throne in Tehran, Iran. The throne was built from 1747 to 1751 for Fat'h Ali Shah Qajar. It was designed by Mirza Baba Shirazi Naqqash-Bashi and royal stonecutter Ostad Mohammad Ibrahim Isfahani.The throne's supports are carved in the shape of men, women, fairies, and demons. 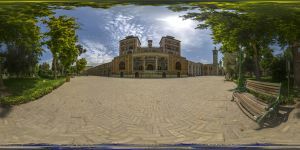 The Royal Balcony of the Marble Throne is said to be built during the reign of Karim Khan Zand but it has been changed several times during the Qajar period. The twin stone columns of the balcony were transferred to Tehran by the order of Agha Mohammad Khan from Shiraz. 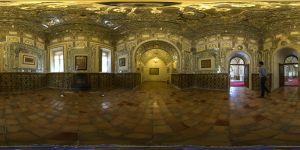 Golestan Palace Ivory Hall (Talar-e Aadj). Golestan Palace Salam and Ivory Halls stairways. Golestan Palace Karim Khani Sanctuary (Khalvat-e Karim Khani) and the tomb of the Nasereddin Shah Ghajar cut in a one piece marble stone. 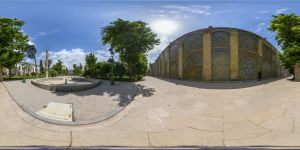 Golestan Palace courtyard, here opposite to the Salam Hall entrance. 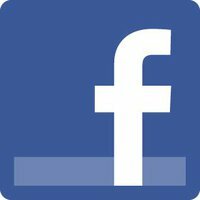 when opened hold down the left mouse button in the image and navigate to any direction. 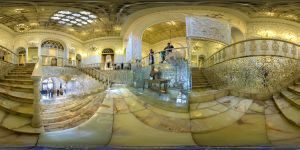 To view the Gallery panoramas in full screen you need Adobe Flash.